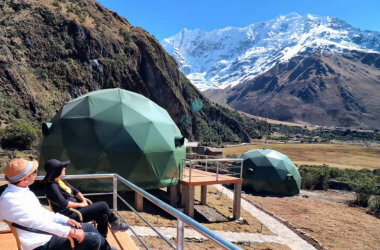 The Salcantay trek, a hike open to everybody all year long, without spaces limitation and connecting the city of Cusco to the famous citadel of Machu Picchu. We are the first virtual agency proposing a reliable, fast and secure system to book your trek on-line. Before you discover this fabulous hike for yourself, we invite you to join us on a virtual tour within Peruvian Andes, on one of the most beautiful treks of the World... Now, take a breath, imagine and dream, you are almost in Machu Picchu... Welcome! Ein fabelhafter Trek im Herzen der peruanischen Anden. Ein Spaziergang durch Naturlandschaften in den Anden ist ein Abenteuer. Genießen Sie die Natur inmitten der Anden. Sie verbringen die erste Nacht in einer Kuppel mit allem Komfort. Am Ende der Wanderung entdecken und besuchen Sie die fabelhafte Zitadelle von Machu Picchu. We also offer the Inca Trail trek, the full tour and Machu Picchu entrance tickets.